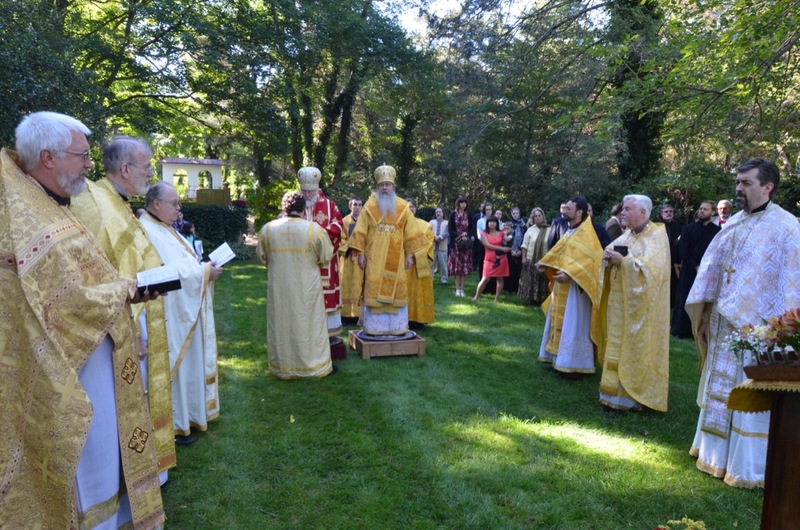 His Beatitude, Metropolitan Tikhon, and His Eminence, Archbishop Benjamin concelebrated the Divine Liturgy at the Chancery of the Orthodox Church in America here on Saturday, September 27, 2014. The Liturgy and festivities that followed marked the 700th anniversary of the birth of Saint Sergius of Radonezh, in whose honor the chapel is named, as well as the 100th anniversary of the Chancery property, originally known as the Westwood Estate. A combined choir of seminarians from Saint Tikhon’s and Saint Vladimir’s Seminaries sang the responses to the Liturgy, at which Chancery and area clergy served. Many faithful from neighboring parishes were also present for the celebration. After the Divine Liturgy, the recently established Order of Saint Romanos was awarded for the first time to four individuals who have made significant contributions to the OCA in the field of liturgical music. The four initial recipients had been selected by the Holy Synod of Bishops, who will name one additional recipient per year in the future. After the Liturgy and presentations, Metropolitan Tikhon hosted attendees at a luncheon on the Chancery grounds. A gallery of photos of the day’s events may be found on the OCA web site and Facebook page.